What Apple’s iPhone 6 and iPhone 6 Plus mean for mobile gaming? Well, the released smartphone comes with two sizes mean quite a lot for games and game developers. Both iPhone 6 and iPhone 6 Plus surpass the former generations in screen size and video resolution. And a bigger screen and a higher resolution are better for gaming. It is quite amazing that iPhone 6 has a 1334*750 resolution and iPhone 6 Plus features the resolution of full HD 1920*1080 which really makes it more competitive with tablets and game consoles. 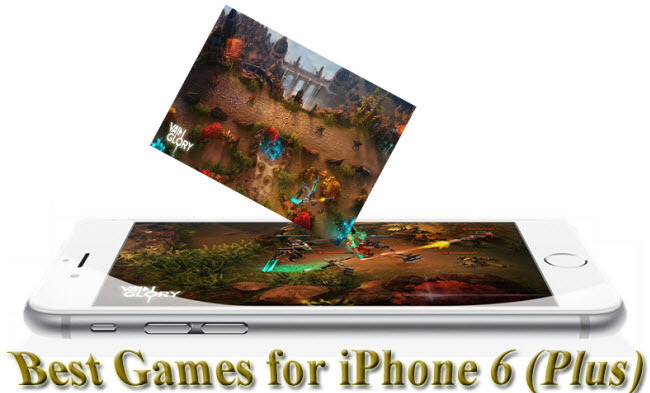 And who are creating games for iPhone 6 and iPhone 6 Plus? Square Enix, Ubisoft, Disney, CD Project Red, Epic Games and EA are some of the larger game developers committed to iPhone 6. We can also see games from smaller game makers like Proletariat and Vector Unit. Apple used Vainglory from Super Evil Megacorp to show off the capabilities of iPhone 6 and iPhone 6 Plus. Vainglory is designed by a few developers, and it is an online battle arena game which will be released this October. It is a free to play game fully optimized for iPhone 6. Infinity Blade III, XCOM: Enemy Unknown, Real Racing 3, Asphalt 8: Airborne, Modern Combat 4: Zero Hour, Sky Gamblers: Cold War, Horn , Lili, Injustice: Gods Among Us, Deus Ex: The Fall, etc. With the design of a bigger Retina HD display, sure that Apple and game developers will have a good cooperation and bring a powerful gaming experience by creating games for iPhone 6 and iPhone 6 Plus.